Thanks everyone for the comments on the Westwood skirt knockoff! Emily H. mentioned a pleated skirt from the August Burda. There are two in that issue and strangely enough one of them was what I was already planning to sew next. I want to sew the other one too but I don’t have any suitable fabric for it yet and I’ll have to grade it, so that’s a way off. Here’s the technical drawing of the one I’m doing now. I am making this in a beautiful 100% wool blue and black tonic suiting from Textile King, which is on Berwick Street in London. I really didn’t want to risk washing it so I tried pre-shrinking using a method I found on the Internet. You wash a big sheet and while it’s still wet lay it out flat. Lay the fabric flat on top, and roll the two together. Pop the lot into a bin liner, tie it closed, leave for a few days, then remove and iron the fabric. It worked pretty well for this fabric. It certainly shrunk a bit and it also got softer. When I bought it the fabric had a rather scratchy feel and that’s gone completely. I will definitely use this method again when sewing with wool, although next time I’ll use a towel rather than a sheet as it might crease the fabric a bit less. I’m not a great fan of ironing. 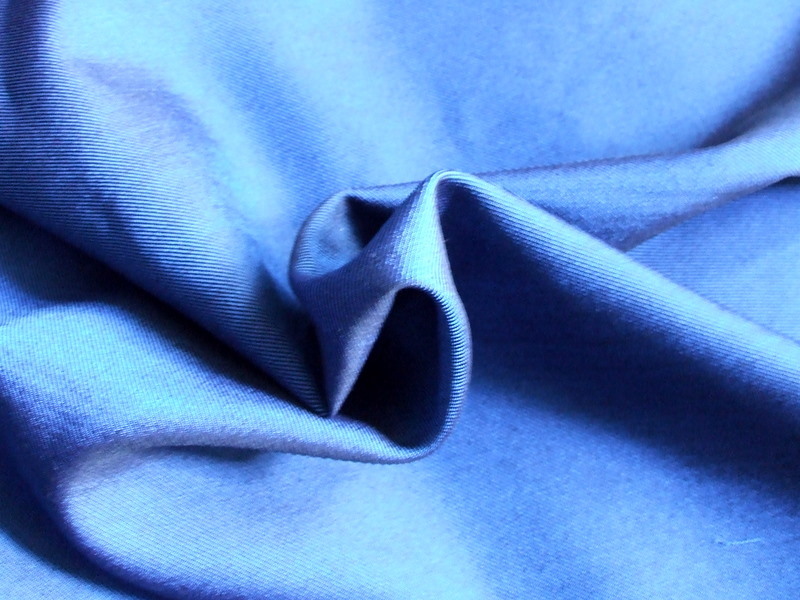 Here’s the fabric. It’s more of a royal blue than the periwinkle shade it’s come out as in the photo. So where does the disaster come in? The pattern calls for 1.55m of 140cm wide fabric, not that I bothered to check this in advance because everyone knows a tiny little skirt takes less than a metre, right? Wrong. Not when it has pleats and is self-lined. My piece started out 150cm wide and probably a bit over 1.5m long so I thought I had plenty. The fabric was cut very off-grain, so I probably lost 5-10cm length in straightening that up. I don’t know how much it shrank when I wet it because I didn’t measure, but some. 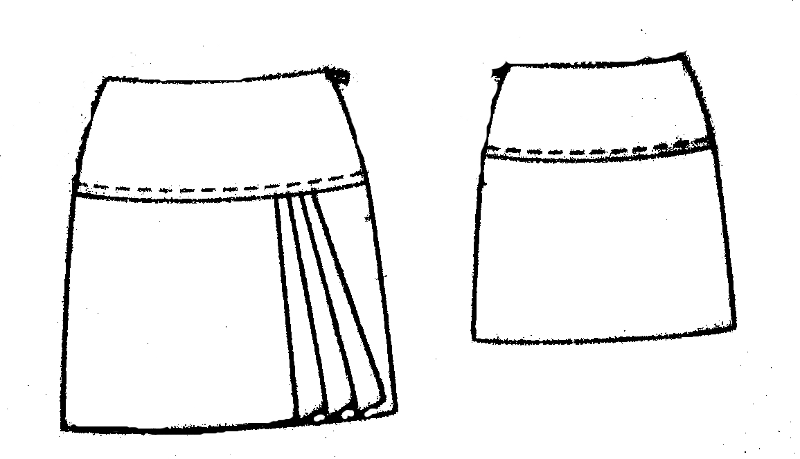 Then I added 5cm to the length of the skirt when I traced the pattern. This becomes 10cm in terms of fabric because the skirt pieces are all cut double with the hem on a fold, another thing I didn’t really think about in advance. So after I’d cut all the skirt panels I didn’t have enough fabric left for the four yoke pieces. This was a new experience because normally I buy far too much fabric and have large bits left over. Eventually, after much rearranging, I managed to squeeze all the pieces out of the remaining fabric by cutting the inside back yoke out upside down. That’s bad on shiny fabric as the shine might be directional, but it’s the inside piece so it won’t show. And I have marked it very carefully with my new favourite gadget, the chalk wheel. So all was not lost but you can bet I’m going to check the yardage in advance next time. Posted on August 29, 2010 December 13, 2010 by catherinedaze	This entry was posted in burda, Cutting, Fabric, patterns and tagged blue, burda, Cutting, dressmaking, fabric, pleats, sewing, wool. Bookmark the permalink. haha, I was thinking about the other one, but this is a beautiful pattern too. Great fabric for it!